A special Idelsohn mixtape to help you celebrate Passover. 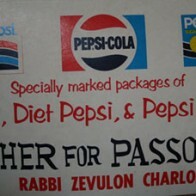 Perfect for any seder. It’s a taste of what’s to come on our June release, BLACK SABBATH: THE SECRET MUSICAL HISTORY OF BLACK-JEWISH RELATIONS, featuring Nina Simone, Aretha Franklin, Johnny Mathis, & many more.